I hope you all are having a great week so far! So today’s recipe is my slow cooker beef stew. First thing first ‘Everyone should have a CROCK POT’ Guys I mean it, this is very necessary and I cannot imagine my life without my sweet sweet Crock pot😊. At first I was so reluctant to get this because I would say to myself, “I do not have a lot of coins to buy something I can do on my stove and pot” Guys it took for my instructor to go to Walmart’s website and literally pulling up a crock pot on sale for me to get one; guys the best money I have ever spent💁💰. The beauty about crock pot is that you can literally slow cook anything and it is ready when you are, you can cook without having to run back into the kitchen to check how your food is going; everything is done in one pot. Crock pot is perfect for meals that usually take a long time to soften but you can still cook pretty much anything. You want to achieve succulent fall off the bone meat, your crock pot got you. I use mine mostly to make my stocks or broth, sauces and stews; I want to try using this to make Jollof Rice or my local Nigerian soup, still working on that and I will definitely let you know how this goes😊. 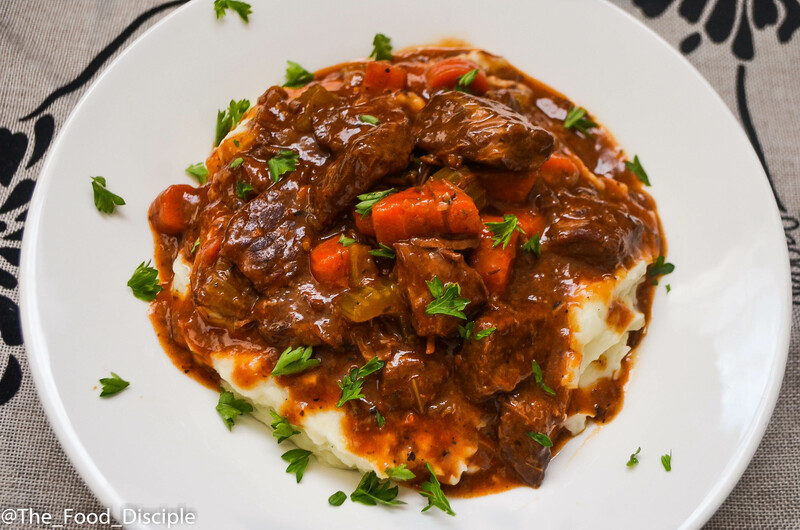 So guys my slow cooker beef stew is one for the books and I you just have to try this and see for yourself that I was not just saying. I served this stew with mashed potatoes and lawddd this is good!🙆. 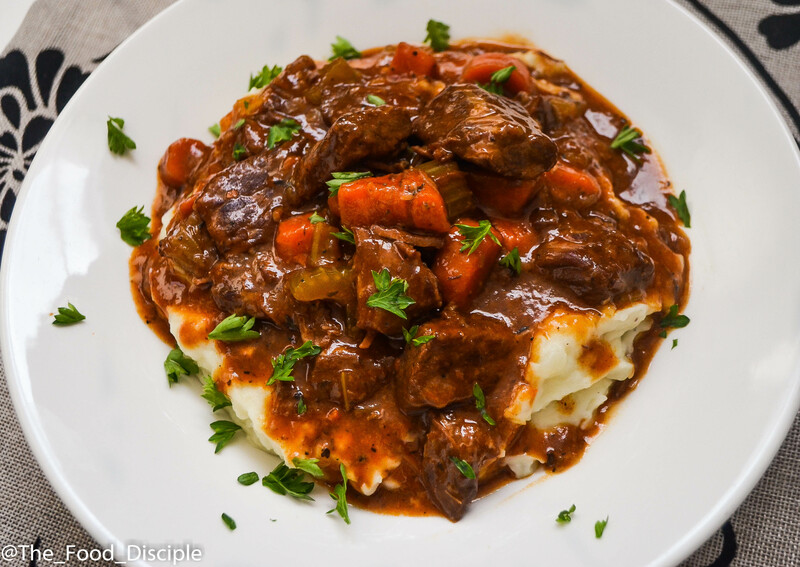 I just found a new love for mashed potatoes, it was never my thing but lately I have found a new love for making mashed potatoes and this stew is just the perfect pairing. You can serve stew with rice as well and it will do amazingly well with pasta. I will love to hear your feedback about this recipe. I will attach a link to the crock pot I purchased. Step 1 To prepare beef stew: season beef with salt and black pepper. Toss beef in flour. Step 2 Heat up oil in a pan and when it is hot, add 1 tbsp of butter and when butter is completely melted, add your beef and brown on both sides for 4-5 minutes. Remove beef and place into a plate. Add 1 tbsp of oil, onion and garlic and saute for 2-3 minutes. Add paprika, tomato paste and cook for 2-3 minutes, add carrot and celery and saute for an additional 1-2 minutes. Step 3 Add your meat stock, beef, black pepper, salt, Italian seasoning/ thyme, and Worcestershire sauce. Bring to a boil and then transfer into your slow cooker and cook for at least 6 hours. Before your 6 hours mark is up, taste for seasoning and adjust with salt if needed, add 1 tbsp of butter, stir, cover and leave to complete cooking time. Step 4 To make mashed potatoes: peel and cut potatoes into small chunks. Bring to a boil and cook until soft and potatoes starts to break or fall apart. Drain and put potatoes back into the same pot and put on low heat. Mash potatoes for a little bit to let some steam escape, this gives the potatoes some texture. Then add your butter and milk or heavy cream and mash until properly incorporated and smooth. Season with salt and pepper and then mash until all ingredients are properly combined. Step 5 Your food is ready!!! 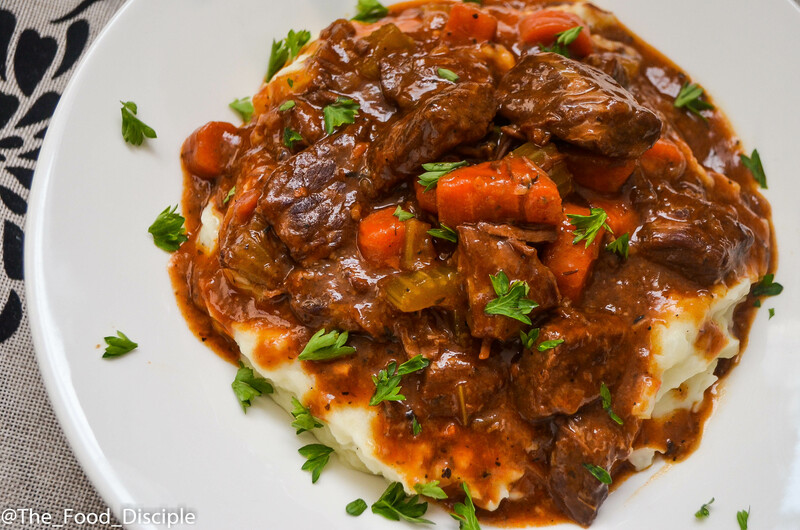 Serve mashed potatoes with beef stew and garnish with parsley.